In many ancient myths, the wound simultaneously provides cause for suffering and source for transformation. 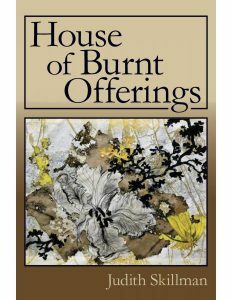 The poems in Judith Skillman’s latest collection, House of Burnt Offerings, reflect this view. While a number allude to mythological or literary figures, most live in the present rituals of daily life. They center on childhood memories, marital struggles, encounters with illness and aging, and the disappointments that result from unfulfilled desires. Many focus on the various wounds, both psychic and physical, that transform life and provide insight. Skillman’s language creates metaphor—another means of transformation—and these metaphors resonate most strongly throughout the book. Perhaps the most obvious metaphors of wounding appear in the poems that explore illness. “Hashimoto’s Disease” addresses the speaker’s realization of a disorder that manifests subtly within her body. The poem opens with a metaphor that illustrates the weight of illness. pokes a shoot through soil. As the speaker becomes aware of the invasive illness, she refers to it as an unwelcome guest. This poem, which culminates in a diagnosis, explores the speaker as she crosses a threshold, identifies with the illness. This opens an opportunity for awareness and understanding of suffering. The understanding is not limited to the physical. Much of the wounding that Skillman contemplates is psychic. And these wounds create spaces for introspection. A few poems meditate on the impact of childhood trauma. In “The Train,” the speaker reflects on making art in the face of difficult memories. It falls like cream into my lap. Later, as she depicts the breaking of a marriage, she accounts an assaultive sound that strikes and threatens a state of union. The poem concludes as the woman, years later, survives the loss, but also accepts, the futile absence of resolution. Skillman makes frequent reference to the transformative effects of aging. Her poems suggest that wounds reshape the aging body. In “Swaybacked,” the speaker opens the poem with reference to her own wounded identity. I enter the animal called self. The speaker continues to muse over the fleeting nature of youth, and in the last lines, expands to the larger experience of aging. I enter the light called dusk. All the symbols of youth swallow, swallowed by Eliot’s violets . One of the last poems in the collection, “In the Doghouse,” depicts a tension between acceptance and resistance. The poem illustrates the speaker as she identifies that in the face of change, the stars, like jeweled gifts, stay fixed. As she accepts the challenges of age, she identifies a familiar comfort in what remains the same. Cold seeps in, sun clips horizon. Skillman’s poems traverse through changes that manifest from living a full life. Her metaphors suggest, not shrinking from scars that result from these changes, but instead learning to embrace and accept the wound as an illuminating source.